We visited on Friday. The Car Park was full to the hedges and this was reflected by the crowds inside. Having presented our Exhibitor's Passes at the front door we were delighted to find our stand strategically placed opposite to the City of Oxford display. Not so delighted with the rather cramped size that we had been allocated. Brian had made the best of what we had by adding one of his own tables for the working models. The boats had to be lined-up as best they could and unfortunately, this left very little space for any descriptive matter alongside. The show generally seemed to be a little subdued compared with past events. A number of the usual traders were absent, Arc Euro, Chronos and Myford of course. I believe that Myford has been bought and is now based in Yorkshire. 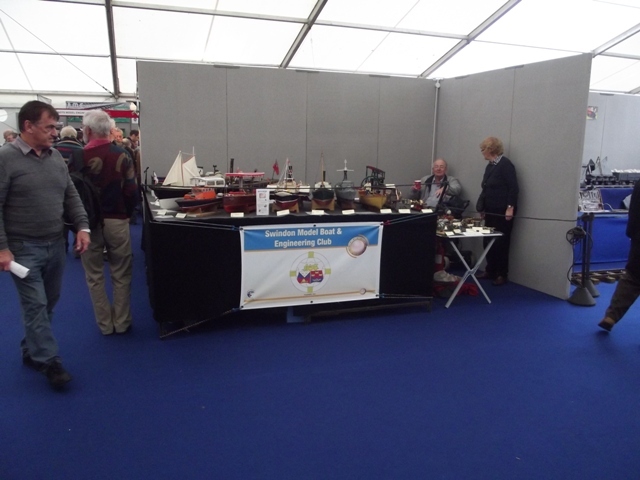 Club stands were as ever interesting but the competition sections were a bit sparse. A bit disappointing but a chance to meet old acquaintances and to stock up for the future projects.